Harbourside Macadamias is a family owned orchard and business, located for over 33 years on the edge of the Tauranga Harbour, near Katikati, with views towards Matakana Island and glimpses of Mayor and Karewa Islands beyond in the Pacific Ocean. Here we harvest macadamia nuts from over 940 macadamia trees, for much of the year, to ensure that you, our customers, receive the freshest and tastiest macadamia nuts available in New Zealand. Our ‘GlobalGap’ Certified orchard also produces kiwifruit, avocadoes and citrus for both international and local markets. 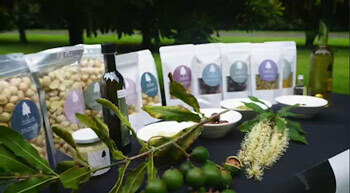 As you'll see within our site, we have a wide and unique array of macadamia products, both sweet and spicy designed for all palates. In addition, our premium macadamia liqueur has been created with our customer in mind, to be consumed deliciously on its own, in cocktails, or with ice cream and desserts. To check out full range of Macadamia products VISIT OUR ONLINE STORE. Another Radio New Zealand interview for you to listen to - this time on Nine to Noon with Kathryn Ryan! We were recently featured on Rural Delivery. Click the play button below to watch the segment (and click the arrows to make it full screen). Check out a recent promotional video created for us. Make sure you check out our Radio New Zealand interview!